EMP Malaysia Trading Division is extending our market into South America. We intend to market and export our range of Agronomic Supply to rubber and oil palm plantations to countries there such as Brazil, Guatemala, Colombia etc. We have an interested South American party which wants to work with our company in expanding our businesses over there. Recently, we couriered out some samples to our distributor so that their company can show off our products to potential buyers. Our Projects and Engineering Division has submitted our EMP 3 mt/hr Dry Rubber Blending line to a Singaporean company. They want to install the system in China for the blending of synthetic rubber of various proportion. In future, NR will be added to the blending line. We gave them a complete full specification Dry Blending Line which includes our EMP Dry Slab cutter, 2 sets of Initial and Final Dry Processors, Cooling tunnel, belt conveyors and EMP Moving Chamber 100 Tons Rubber baling press. Recently, one of MARDEC rubber factory has requested our company to quote for some rubber processing machinery and auxilliary items. Though we have never concentrated our marketing efforts locally but to overseas customers, our presence in the rubber industry over the years, has made local rubber factory owners to be aware of our expertise. We quoted at least 8 items to this MARDEC rubber factory which included 2 sets of our EMP 18"dia. x 28" Crepers. Our Trading Division has just submitted a quotation to our existing client for the supply and delivery of our Waterbased sealant for our RF Eaves with Cover Rainguard system. They require this sealant to complete the installation of their RF Eaves which they purchased in 2011. Overall feedback is positive on these eaves and cover. As their rainy season is coming soon, the eaves will prevent rain washout and tapping can be carried out in the rainy season. This enhances productivity and tapping days available. Our Thai buyer came to visit our manufacturing plant yesterday to inspect the progress of their skim block dryer project. They saw the completed final shredder, dryer structure, mini trolleys and confirmed the order for the steam heating system to be incorporated with the skim block dryer. Later, they inspected the dryer control panel and saw a photo of the completed and tested Sartorius metal detector complete with belt conveyor. Our company is expected to deliver all the items under order by end September 2012 or earlier. Our Industrial Division has just quoted a rubber press manufacturer for the supply and delivery of our EMP 100 Tonnes Hydraulic and Electrical packages. Our packages include the supply of High/Low Dual hydraulic pump, Valves, Solenoid Directional control valves, Main hydraulic ram, auxilliary ram and Electrical control panel. They have proven to be reliable, easy in maintenance and robust. Our services include the testing of the system at the manufacturer's factory. Our Projects and engineering Division has just submitted our 90-95 Tonnes Single Chamber Automatic Rubber baling press to an international renowned compound rubber company based in Malaysia. Designed with a pressing force of between 90 to 95 Tonnes, our press has the capability of pressing 80 to 85 bales per hour. Weight of bales can range from 17.5 to 35 kg per bale. 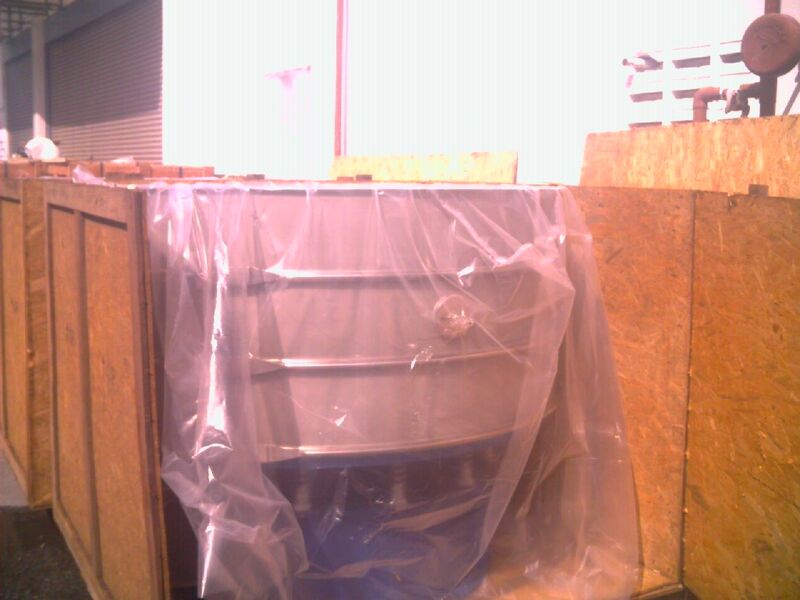 Our Fans Division has just delivered 2 sets of Centrifugal fans and 4 sets of 24" dia. Axial fans to our buyer. They were delivered yesterday. These fans will be used for the Dry Rubber Cooling Tunnel which is destined to Vietnam. In April 2012, our Projects and Engineering Division submitted an EMP Rubber Processing line to a South American company. They wanted to process cup lumps and sheets into SMR 20 grades of rubber. The capacity of our proposed line is from 1.0 mt to 2.0mt/hour. We offered our Wet Processing Line at 2mt/hr while our EMP dryer is at 1mt/hr. In future, they only need to invest in another 1mt/hr dryer and the line can process 2mt/hr. Our EMP Engineering and Projects Division is expected to receive an export order for one set of EMP Dry Processor and one set EMP Twin Scroll Wet Prebreaker. The client has emailed us their interests in purchasing these rubber processing machinery from our company. The EMP Dry Processor will have a processing capacity of 2mt/hr (dry)for processing undried dry rubber while the EMP Twin Scroll Wet Prebreaker has a capacity between 1 to 2mt/hr. This is a pre-cleaning machinery and to be placed at the front end of the NR Wet Processing line.